This series of products are made by compounding fluid paper,plastic film,woven cloth or aluminum foil into double layer,three layer, three layer or multi-layer new materials,which are used for packaging products of cement, chemicals, forage, food, medicine, adhesive tape cloth,plastic coating paper cups and fast food boxes,etc. 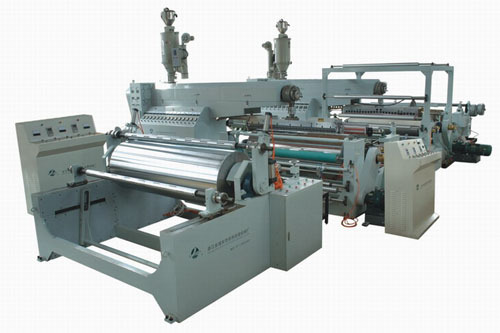 The equipment abroad applies to film: the base materials of mold release paper, cup paper, bowl paper, melon seeds bag paper, non-woven cloth, gauze, aluminum foil. THe finished film has these characters such as fastness, fine effect, equal thickness and fine sealed capability and etc. Standards of various kinds are up to the international standars. Application range: Paper-plastic complex, Plastic-plastic complex, Aluminum-plastic complex, Paper-aluminumplastic complex, Alf-adhesive series. 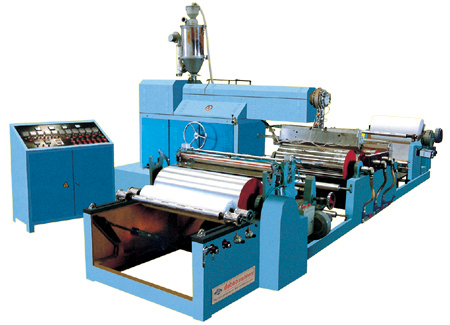 This series machinery are used to finish the double-sides film technical adanced type of airplane at domestic, the euqipment used to need produce and complete compound materials at one time like double-sides plastic-coated paper, Hard-gloss photo paper or Multi-layer like milk box, syrup box, drink box and etc..It is an ideal equipment of producing asepsis wrapper.